I don't have any plans today so I kept it simple. 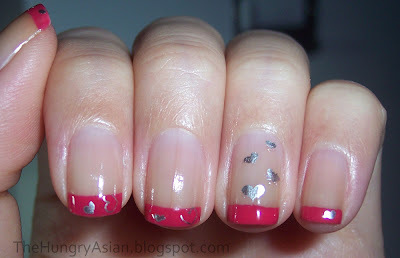 I used Colorama Candy Apple on the tips, and China Glaze Millennium for the stamp. Have a great day! looks great!!! i'm rubbish at doing french manicures! Aw, so cute and classy! Aww, your nails are already growing! They look cute like this too. Happy Valentine's Day, Kae! Lovely and sweet! Just like you. those little hearts are so adorable!